@murgatroid99 neat, do you have any photos? I saw that yesterday on reddit, but I don't think there were pictures. What I remember is that people were saying that there were different adjectives, i.e. Curious Killbot, Enraged Killbot, etc. Having only one Killbot kinda affects Mary O'Kill's hype. But four different names means you could have 16..? Just torpedo your own deck so it is useless and no longer possible to win and give it to your opponent. "Here, take this. It is your problem now." but is there a decent d6-pool resolution mechanic that takes little to calculate, favours pools of 2-4 and doesn't bias towards an attacker or defender as pools increase? 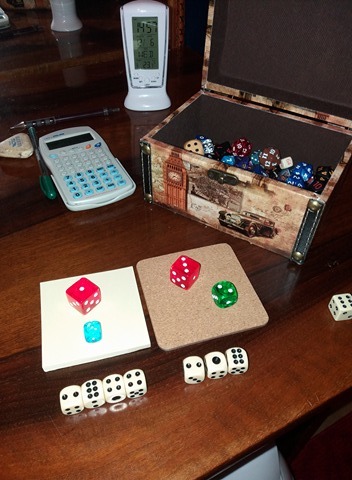 One of the popular RPGs uses "roll a fistful of dice, count successes, where a success is 4-6 on the d6". I think I need to set my high-level goals first..
@AlexMitan Yes, it looks like you arrived at this dice mechanic 'cause you had two things and pushed them together. It looks to me like all of those Everythingamajig cards have two abilities from existing cards and one new ability. @murgatroid99 Scryfall's discord rifled through them -- every ability has been printed on another card before. Do you know what type of game play you are looking for? @doppelgreener Even the one where you swap everything with another player? 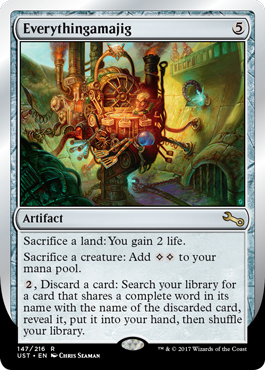 more the "accumulate a combo then blow it up"
@doppelgreener They all from artifacts as well? @AlexMitan If your units carry around resources and roll dice corresponding to those resources, you might want to look into things like requiring resource expenditure to make rolls. @AlexMitan have you ever played orcs, orcs, orcs? like... hey, there's a shuttle with 12 red coming my way..
One player per ship right? ahh bit more difficult then..
cya, np. Just keep thinking about what you want the game to play like and what styles of play you want to encourage. Wholly original mechanics, unlike any previous game in its class. Game of pure skill, with significantly less rules than chess and no special conditions. Designed in the spirit of medieval tile games, currently in abstract form--gameplay may be understood as "Risk without dice"
can kind of gather that it is probably a 2 player strategy game? exactly! only it is a pure placement game, requiring no token movement. Who should play your game? "A struggle for territory in a condition of rapidly diminishing resources. " (dang video gamers have clouded matters, but "gameplay" has value. but, even though the game is simple enough that a 6-year old can play, and complex enough as to be unsolved, very, very few people get it just by reading the 9 simple rules. Anyway, my understanding is that the gameplay is something like "Place pieces to expand influence. Control more regions to win the game"
@murgatroid99 That is very helpful! and not really a "solvable" game, enough complexity you will get a different game every time? only in the 2x2(2x2) version! but 3x3(3x3) offers an amost perfectly "balance asymmetry"
I would drop the comparisons to chess, or at least reword them. Currently, it kind of reads like you're trying criticize chess down to make your game sound better, which doesn't look good. it is definitely more elegant that Chess, but I take your point! Also, I can't figure out what "Factorial nature of the gameboard" is supposed to mean. @DukeZhou But in what sense is the game board itself "factorial"? I had an idea to write a three-column thing, "Thing I like in game X" -> "Concept I like that underpins it" -> "How it could fit my game"
@DukeZhou This doesn't really clarify things. The game board itself is a square. using higher level math things as a marketing tool isn't inherently bad, I am just too far out of the demographic to properly critique it. @murgatroid99 ic. good advice then! I don't mind randomness in games as long as it doesn't make things too "swingy"
@DukeZhou This is a limited and uncharitable view of "randomness"
ok, just to be clear, hidden info = unknown OR chance? Hidden info can be both yes. maybe that peg solitaire game? Btw, does anyone here know how to model a certain distribution on anydice? Assuming you're referring to the card game War, I don't think that counts as a game at all. It's all the way on the other end of the randomness spectrum: players make no decisions, they just act out a random process until somebody "wins". I think the minimum for some thing to be a game is it needs choices? But many people find it to be an incredibly interesting, fun, and easy to play game, and we have a small, but growing, community of addicts! Also, can I have some feedback on something? Mbrane is the app you can play [M] games on! this sounds really cool, is it something one of you made? @murgatroid99 Poker I think is an especially interesting RNG & Hidden Information game, particularly for the way statistical analysis can be used to maximize desired outcomes. Recent work in poker solving is quite exciting! what'd you make it in? Put together my team, a professional marketer and a trained programmer (BS). We're all working for sweat equity because we believe in the potential. That's one of the strengths of abstract games. You can make a Chess board at home! is setting a difficulty and dig number a genuine tactical choice? @DukeZhou I had another question about the game: as the game approaches the end, how easy is it to look at a board state and determine who is doing better?